To serve bread in a Spanish way together with your meal on the table, a representative breadbasket is necessary. 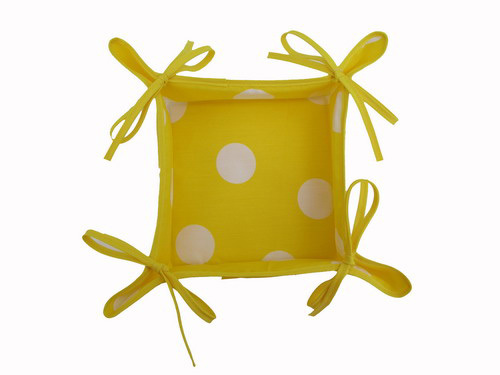 This breadbasket made of material with polka dots will bring a very flamenco and Spanish-like air to your table. This item can be used to serve bread or fruit, or even to leave objects like keys. Measurements: 20 cm x 20 cm. If you want to serve bread or fruit on a very flamenco-like table, you only have to choose the colour. We offer a great variety of colours to choose from for your breadbasket. This item can be used to serve bread or fruit, or even to leave objects like keys. Measurements: 20 cm x 20 cm. This item can be used to serve bread or fruit, or even to leave objects like keys. If you want to serve bread or fruit on a very flamenco-like table, you only have to choose the colour. We offer a great variety of colours to choose from for your breadbasket. Measurements: 20 cm x 20 cm.